Graph outlining the Change Vector Analysis – updated version based on the graph from Chapter 9. 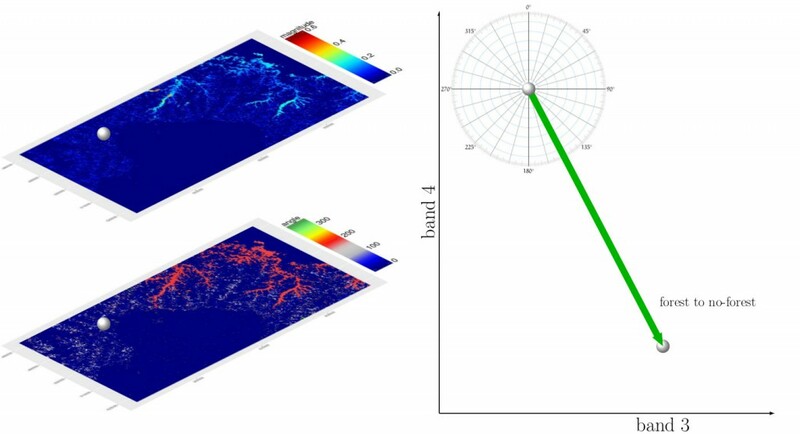 We explained in Chapter 9 among other change detection methods also the change vector analysis practically using the rasterCVA() command in the RStoolbox package, as well as outlined the approach graphically. During my last lecture on temporal and spatial remote sensing approaches I realized that the graphic needs some fixing as well as the RStoolbox function, moreover, certain explanations were missing. Hence, Benjamin Leutner adapted the rasterCVA() command and I tested it again and created new graphics explaining this approach for land cover change analysis. The first (slightly modified) graph that is also in our book shows the general approach. Two bands for each year (e.g. the RED and NIR band) are taken and the changes in pixel values between these two years are shown as angle and magnitude. a link of actual results and the xy-graph. In the following new figures we show the actual results of the land cover change vector analysis using band 3 and 4 of Landsat (E)TM for the study region used in our book and three angles and magnitudes of pixels values between 1988 and 2011. Change Vector analysis explained on three change classes using the actual rasterCVA() output and band values. Meaning of the angle values from a rasterCVA() output. Actual angle and magnitude using band 3 and band 4 for a forest to no-forest conversion pixel. Change Vector Analysis results using wetness and greenness for two locations of forest to forest and forest to no-forest conversion. Please update to the newest development version to access the updated RStoolbox functionality to redo these analysis. Please contact us for any recommendations concerning these graphs. great book. Thanks a lot!